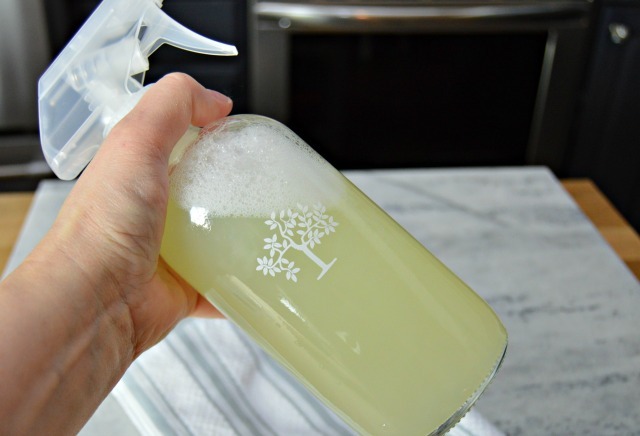 This Homemade Grease Cleaner Spray cuts through the toughest grease and will help clean up even the greasiest, stickiest messes in your kitchen! A few years ago, I shared a different version of de-greaser, but it required quite a few ingredients. Now that I’ve been making my own homemade cleaners for a few years, I’ve discovered a new way to clean grease with only a few household ingredients. This cleaner not only cleans grease, I use it for cleaning counter tops, our kitchen table, the inside of our refrigerator and our stovetop too! It cleans so well and leaves a nice, fresh citrus scent behind! This post contains affiliate links, which means that if you purchase anything using one of the links provided, I will receive a small commission. 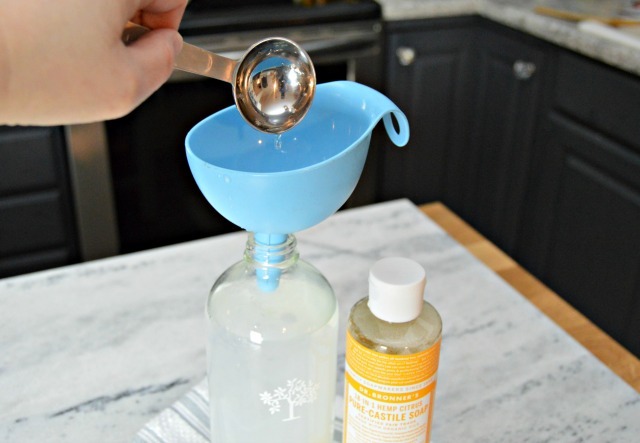 Start by filling your spray bottle with 1 and 3/4 cups of distilled water. Distilled water will help lengthen the shelf time for homemade cleaners. Next, add 2 Tablespoons of Castile soap. The Castile soap (which is a vegetable based, concentrated soap) will help clean and disinfect. Last, add 20 drops of Orange Essential Oil. 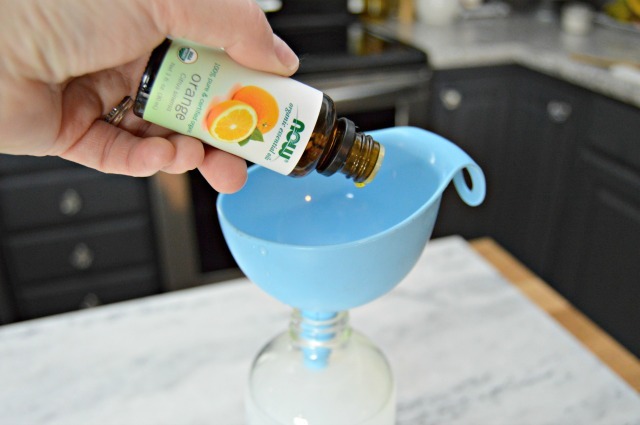 Orange essential oil is a strong degreaser that also removes sticky residue…it’s my favorite out of all of the essential oils. Bonus…it smells great too! Shake well before each use. Because we aren’t using any chemical binders in this recipe, there may be some separation of ingredients between uses. Simply give your grease cleaner spray a shake, spray your surface liberally and wipe any messes or grease spots away with a clean sponge or cloth! 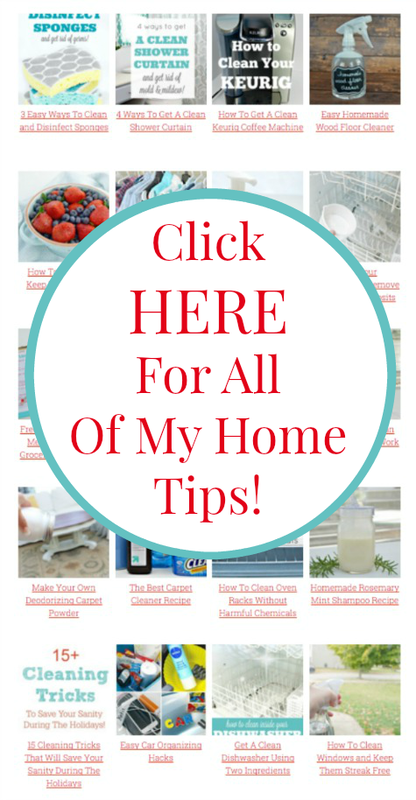 Every cleaning TIP means I have to wait and buy a new product I am trying to save money not spend. HI Jess, Can this cleaner be used safely on granite counter tops? Or do you have another solution I can make and use? I want to buy items from your recipes ONLY, can not find a blank order sheet. Do not want what is suggested for my first order. Want to get in on the free offer also???? 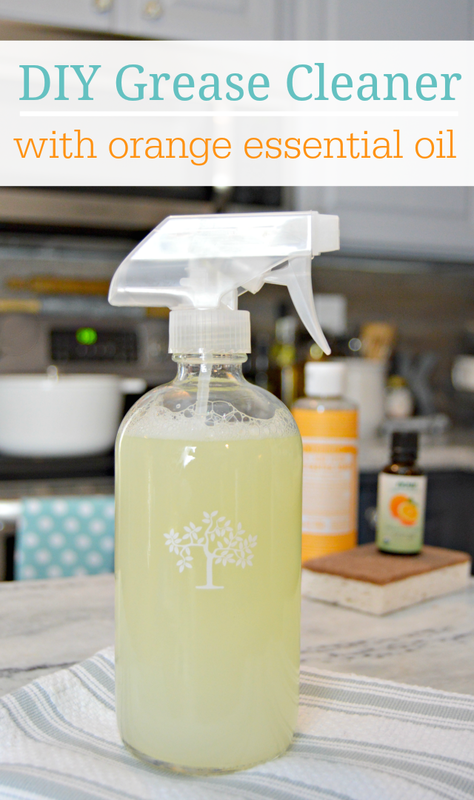 Does the spray bottle have to be glass since we are using Orange essential oil? are PET bottles ok for this? I have used plastic bottles for years and have had no issue. Since the orange essential oil isn’t super concentrated, it shouldn’t hurt at all. Where do you get the larger container spray bottle like you pictured… you only showed the much smaller one … Why??? When using essential oils , you should always use a glass bottle. The reason you do not put it in plastic is because it pulls the toxins from the plastic into what you are using. Just trying to be helpful and share what I know! Can I just use Doc Bronner’s with the citrus oils already in it? Should the oil still be added? The essential oils gives it added degreasing and cleaning abilities. I never make mine without it. Where can we get the cute little tree on the bottle? Fyi I found the Pure Castile soap just by chance at Target. A 2 fl oz bottle. So didnt have to invest a lot to try. It is the citrus scent also. I will add some orange oil in still. So if you have a Target close check it out or online, and you can usually find a orange essentials oil most places anymore. I use Young Livings which are very concentrated. They dont recommend plastic but I am using that because its diluted. I bought my bottle at Walmart for .97. I am wondering if anyone has used this on kitchen cabinets? That is my reason for trying it. Is there anyway to print this other than doing a screen capture? Been using your DIY Tips and recipes and thank you for all these great ideas. Jessica. I have been making this since you told us the first time. I love it. And the Castile I think will make it stronger. I clean counters, sink, stove, fridge and table with it. Spray it on my mixer to get batter off it. The orange smells so nice and you forget you are actually cleaning. I love it. Can I use this on my stove top? And also what is the shelf life on homemade cleaner? Hi, Tonya! I use it on my stove top all of the time, so Yes! Also, I wouldn’t keep it more than 3 months, but to be honest, I use it so much that I make it at least once a month. Hope this helps!